It was another one of those harried days - I felt vaguely grumpy from getting too little sleep because I've become so used to waking up at every little sound my kids make that I'm now an insomniac. Also, I'm a worrier. I can't help it. I lay awake at night thinking about nothing and everything - that weird bump I found on the back of one kid's knee, the persistent grumble in my stomach, why American politics is so polarized, and exactly what time do I need to roll out of bed so that I still have enough time to throw together a lunchbox and get to the preschool on time (or maybe just 5 minutes late)? It's possible, I also drink too much caffeine too late in the day. I digress. The previous night, I laid awake distraught over eggplant dip, and now I stood in the kitchen with Cynthia and Christine passing around pieces of flatbread with various versions of eggplant dip, "OK, which do you like better? Bite A or B? Really? Are you sure you like B? What?! And you like A better? Well you're both no help!" In that moment, it felt like world peace depended upon which eggplant dip tasted better, and I was at an impasse. (I know this sounds ridiculous, and that's because it was. This is also a PSA on the importance of sleep. Don't be like me!) My dad would be the tie-breaker. "OK dad, it's down to you. Which one tastes better??? No pressure. Actually, yes, pressure. You're deciding!" My dad looked at me dubiously, as I shoved a bite into his mouth. "Mmmm, yeah this one tastes good. Kind of creamy." And then I pushed the second bite his way. "Mmmm, yeah this one tastes good too." Exasperated, I cried, "Oh, come on! You said almost the same thing twice!" My dad looked at me like he did when I was a teenager, and I was being particularly hormonal and witchy. He grunted, "Mmm. The second one. I can taste that it has eggplant." The tie breaker - because an eggplant dip should also taste like it contains eggplant. Brilliant! 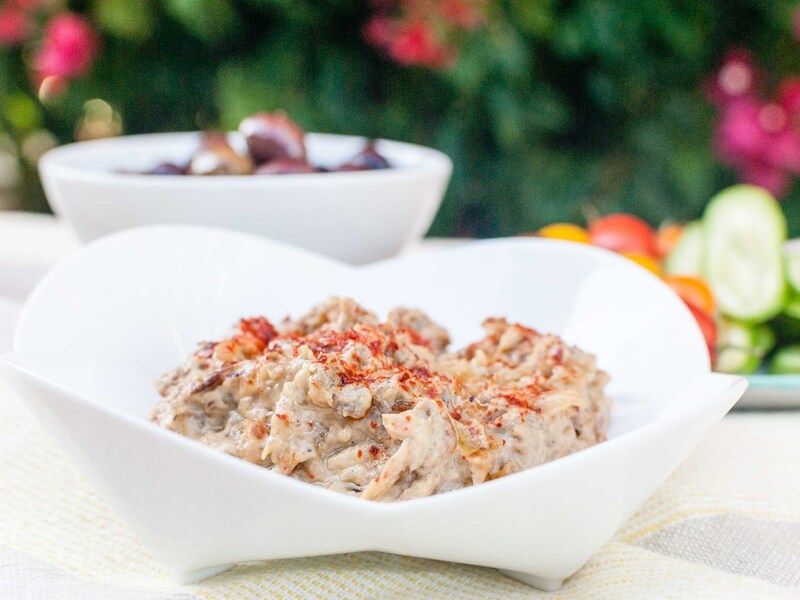 So, here is my recipe for Eggplant Dip with Caramelized Onions and Tahini: The roasted eggplant is silky, the caramelized onions adds deep savory sweetness, the tahini coats the tongue in nutty richness, and most importantly, you can still taste the eggplant! Sometimes it takes a village to raise children, and sometimes it takes a village just to make a bowl of eggplant dip. 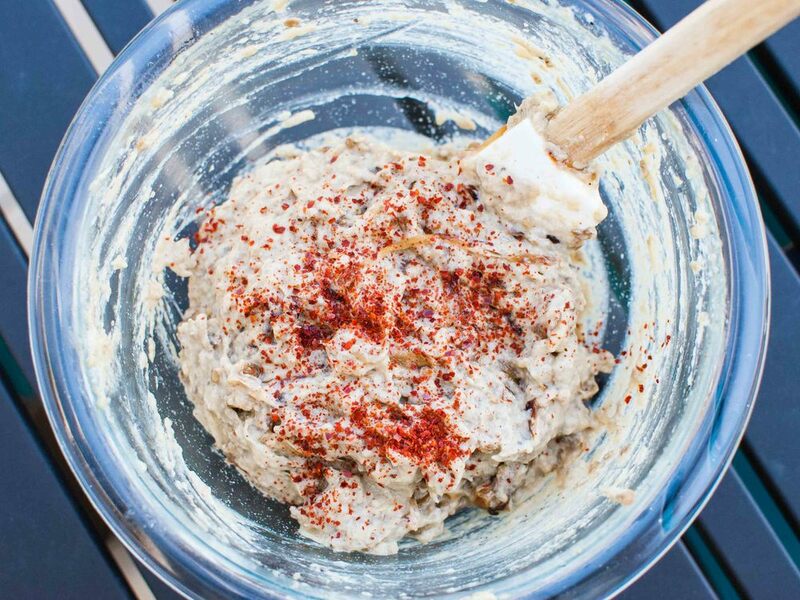 It's darn good eggplant dip. Notes: This eggplant dip is a delicious and different accompaniment to a crudité platter, especially if you throw in some wedges of pita bread. The texture is already a bit creamy from the roasted eggplant and tahini, but you could extend the dip and make it even creamier by stirring in some plain yogurt. It will be a different kind of delicious. My dilemma as to whether to include the yogurt in the recipe was great (see babble above), because both versions of this dip are delicious with or without the yogurt. However, aside from using this dish as a dip, it also makes an amazing spread for Chicken Shawarma Flatbread or a fancy pizza, if you will. I repeat, AMAZING. And for this use, I say, no yogurt. I call for aleppo chile flakes in the recipe, which is worth seeking out. I got a bag on Amazon, and it's now my go-to for chile flakes. Aleppo chile is commonly used in Middle Eastern cuisines, and adds a little heat (without being over-powering), bright acidity, and an interesting je ne sais quoi to whatever you sprinkle it on! Preheat oven to 400 degrees F. Line a rimmed baking sheet with aluminum foil and grease lightly with oil or cooking spray. Prick eggplants all over with a small sharp knife, to allow steam to escape while the eggplants roast. (Don't skip this step or beware of exploding eggplants!) Place pricked eggplants on baking sheet and roast in oven for an hour or more, until eggplants are wrinkled, deflated, and scorched in spots. Remove from oven and let rest until cool enough to handle. 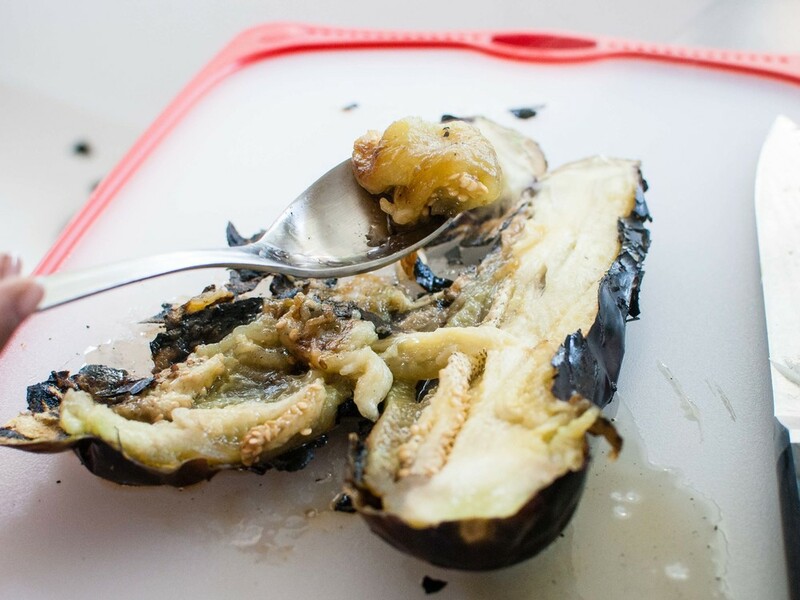 Using a spoon, split the roasted eggplants open, and scoop up the soft inner-flesh from the charred skin and into a colander. Stir in a sprinkle of salt, and let drain for 5-10 minutes. Press the eggplant with the back of a spoon to squeeze out any excess liquid, then scrape into a large bowl. Meanwhile, trim the ends of the onions. Cut the onions in half from root to tip and remove the papery skins. Place the onions flat-side down, and slice them thinly (1/8" thick) from root to tip. Heat 1 tablespoon of olive oil in a large wide pan (12") over medium-low heat. 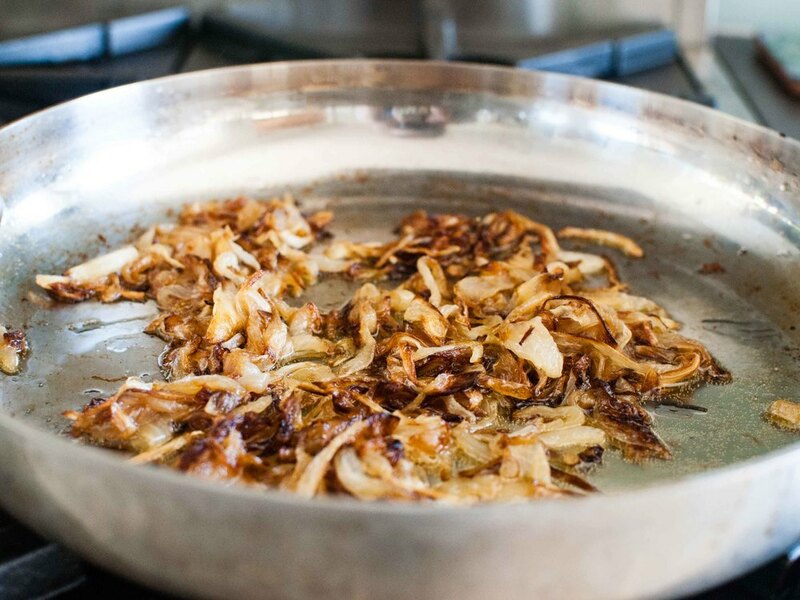 Add the sliced onions and stir to coat the onions in oil and distribute the onions evenly across the pan. Let the onions cook, stirring occasionally (every 5-10 minutes), keeping the heat at medium-low. Continue to cook until the onions are a deep golden brown, about 45 minutes. If onions look like they are beginning to burn, lower the heat a bit. 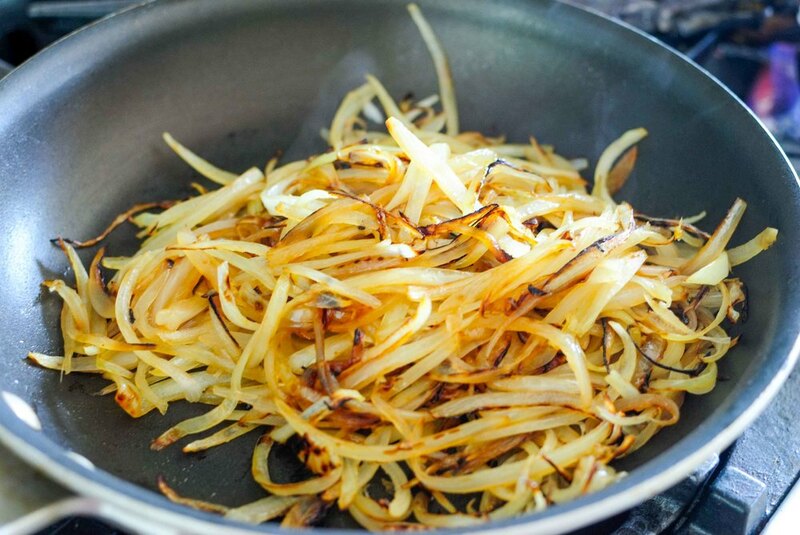 Once the onions are caramelized, drizzle 2 tablespoons of water into the pan, scrape up the brown bits (fond) from the bottom of the pan, and stir it into the onions. Remove onions from heat, and let cool. Stir the eggplant around a bit to loosen it up and make a chunky paste. Add caramelized onions, 1 tablespoon olive oil, tahini, lemon juice, cumin, kosher salt, and aleppo pepper flakes or black pepper, to taste. Stir well and taste again to adjust seasoning. Transfer dip into a serving bowl. Drizzle the final tablespoon of olive oil over the dip, and sprinkle with another pinch of aleppo pepper just before serving with pita bread wedges and sliced vegetables. Potato salad isn't the most alluring side dish at the barbecue - often times overcooked potatoes are drenched in mayonnaise, which makes it difficult to tell what other ingredients lurk under the dressing. 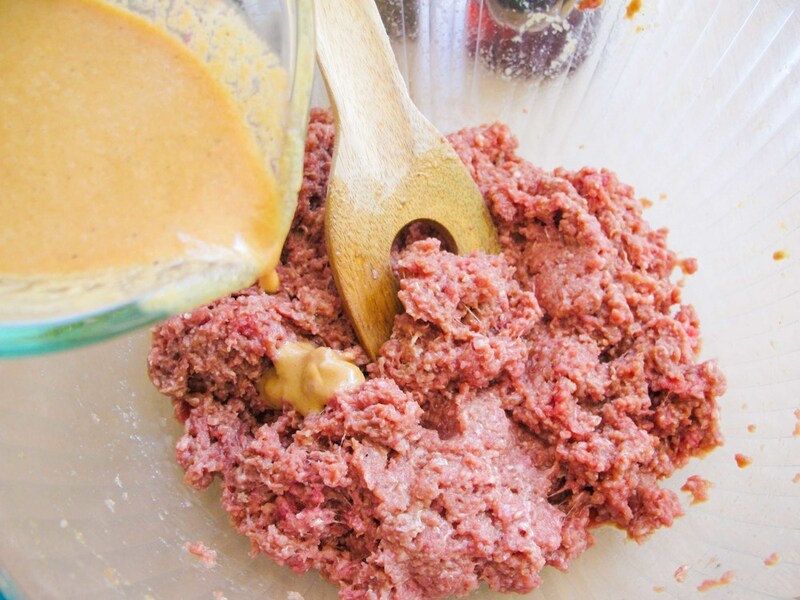 But, this mustard-heavy, tangy version is bright and flavorful, a perfect counterpoint to rich barbecued meats. 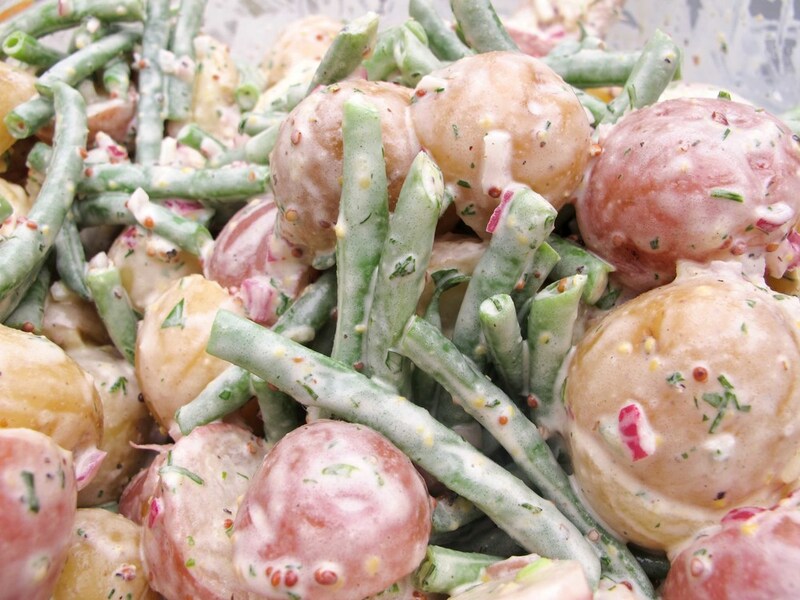 The baby potatoes are supple and firm, while the crisp green beans lend a fresh crunch to every bite. All the while, the light and tart mustard dressing showcases the beautiful vegetables in appearance and flavor. Notes: This side dish can be made in advance and only gets better after the first 24 hours. Also, adding the seasoned dressing to hot potatoes will yield more flavorful potatoes. The potatoes will absorb the dressing while they are still hot and it makes such a big difference in their flavor! You can also substitute the green beans for practically any other hearty summer vegetable, but I love the crisp snap from the green beans opposed to the dense chew of the potatoes. In a large pot, cover potatoes with 1 inch of water and season water with 1/4 cup of salt. Bring the potatoes to a boil over high heat and cook for 15-20 minutes, until tender and easily pierced with a knife. As the potatoes are boiling, in small bowl combine the red onion, garlic, whole grain mustard, dijon mustard, mayonnaise, apple cider vinegar, salt and pepper. Whisk to combine and set aside. When the potatoes are cooked, strain them carefully into a large colander. Drape a clean kitchen towel on top of the potatoes to absorb any excess moisture. In the same pot, bring water to a boil and season with salt. Add the green beans and cook until tender-crisp, about 1 minute. 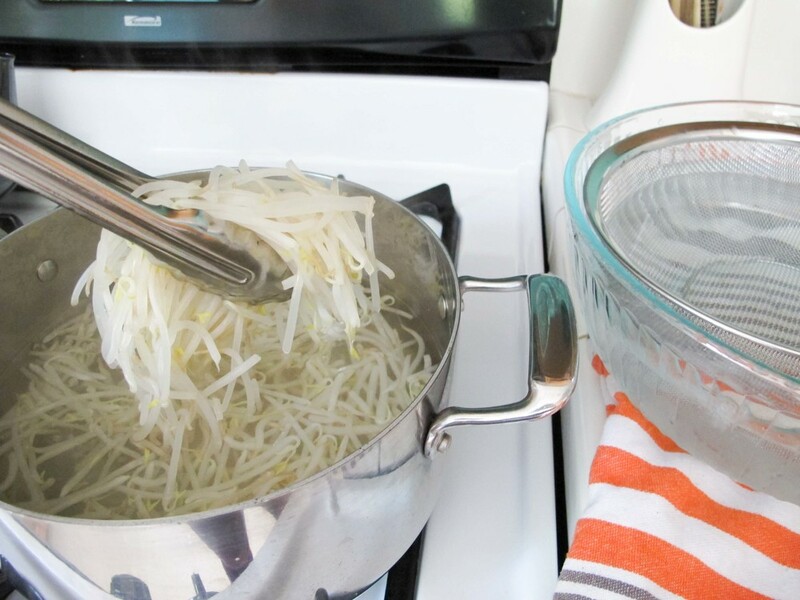 Strain carefully into a colander and toss to release steam, excess water, and to cool slightly. Once the potatoes are cooled enough to touch (but still very warm or hot), slice in half and add to a large bowl. Add the mustard dressing to the potatoes while the potatoes are still hot so they can absorb the flavors in the dressing. 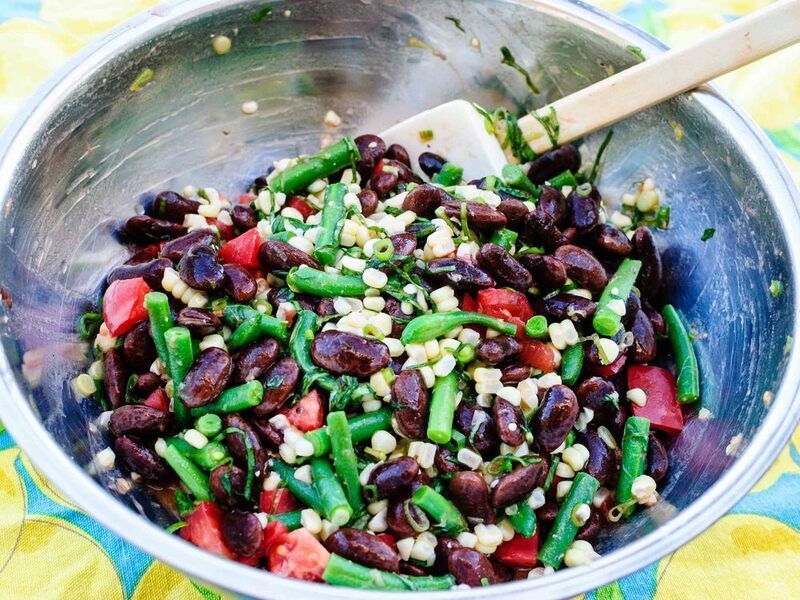 Add green beans and toss to coat with the dressing. I love me a rice salad. A bit ago, I cooked a Korean meal for us complete with Seafood and Green Onion Pancake (Pa Jun) and a Soft Tofu Stew (Soondoobu Jjigae). 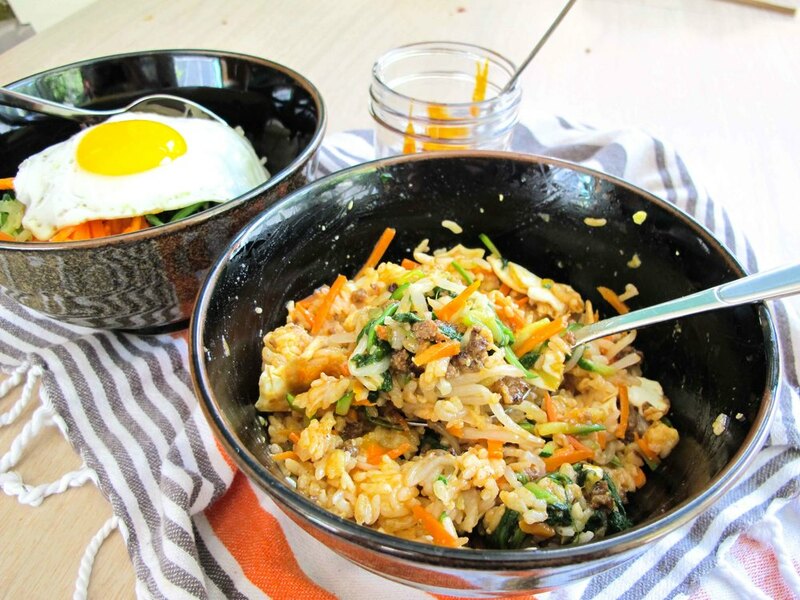 Bi Bim Bap is also a traditional Korean dish with rice, various barely-cooked vegetables and topped with an egg. 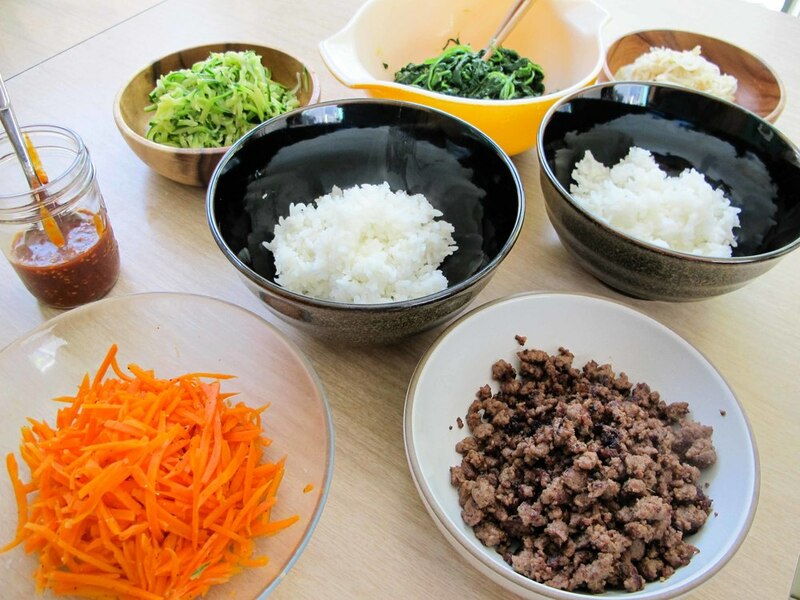 I like to describe Bi Bim Bap as a rice salad dressed with a browned and runny egg. This is what attracted me so much to this recipe: the various textures, temperatures and flavors make for an elegant statement dish. Ottolenghi' rice salad is nutty from the rice and quinoa, crunchy and rich from two kinds of nuts, and has a surprising subtle sweetness courtesy of the cherries and browned onions. Finished with herbs and spicy arugula for brightness, it's a wonderful side dish to practically anything. Notes: This recipe yields a staggering amount of food. As written, it is at least 8 if not 12 generous servings. Tart dried cherries may be cumbersome to acquire, so I think that dried cranberries or even dried apricot would be complementary substitutes. This is a wonderful dish to bring to a potluck or a holiday gathering because of its versatility and because it makes such a large amount. Place the wild rice in a saucepan, cover with plenty of water, bring to a boil, and then turn down to a gentle simmer and cook for 35 minutes, until the rice is cooked but still firm. Drain, rinse under cold water, and set aside to dry. Mix the basmati rice with 1 tablespoon of the olive oil and 1/2 teaspoon salt. Place in a saucepan with 1 1/3 cups/ 330 ml of boiling water, cover, and cook over the lowest possible heat for 15 minutes. Remove from the heat, place a tea towel over the pan, replace the lid, and set aside for 10 minutes. Uncover and allow to cool down completely. Bring a small saucepan of water to a boil and add the quinoa. Cook for 9 minutes, then drain into a fine sieve, refresh under cold water, and set aside. 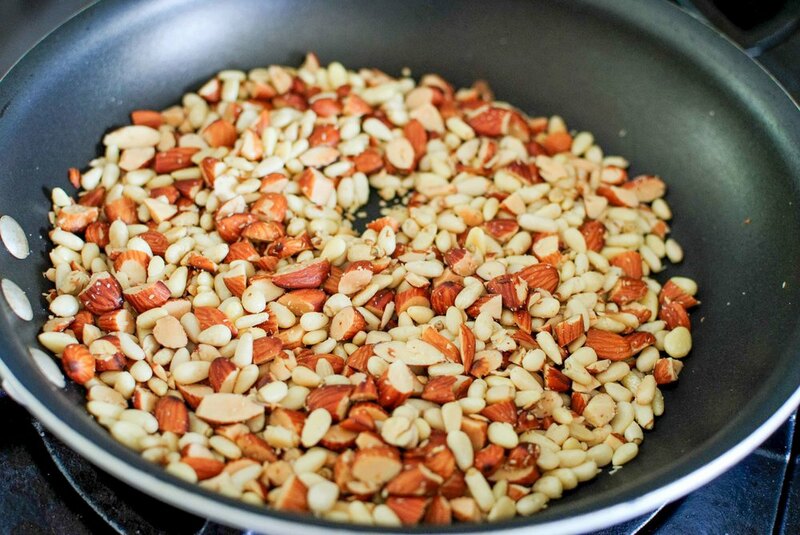 Place the almonds and pine nuts in a small pan with 1 tablespoon of the olive oil and a pinch of salt. Cook over medium-low heat for about 5 minutes, stirring frequently. Transfer to a small plate as soon as the pine nuts begin to color and set aside. Heat the sunflower oil in a large sauté pan and add the onions, 1/4 teaspoon salt, and some black pepper. Cook over high heat for 5 to 8 minutes, stirring often, so that parts of the onion get crisp and others just soft. Transfer to paper towels to drain. 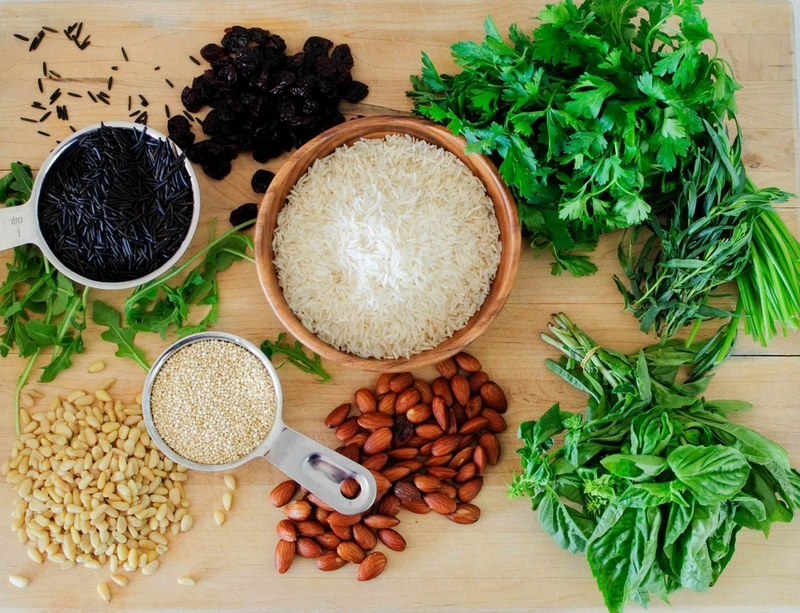 Place all the grains in a large bowl along with the chopped herbs, arugula, fried onion, nuts, and sour cherries. Add the lemon juice and zest, the remaining 3 1/2 tbsp olive oil, the garlic, 1/2 teaspoon salt, and some pepper. Mix well and set aside for at least 10 minutes before serving. Korean people love their pancakes! Kimchi pancakes, green onion pancakes, sliced fish pancake fritters, mung bean pancakes, chive pancakes with a million jalapeños . . . the list is seemingly endless. If it's a thing, it can be pancaked. I love them all, but I especially like this one because it doesn't require any ingredients you couldn't find in a standard grocery store. I can confidently speak for myself, for you, and every other living being in the world when I say: when you are craving Korean food, it must be satisfied immediately. Mung beans, Asian chives and kimchi can often require a special trip to an Asian market. Ain't nobody got time for that! These green onion pancakes are tender, crisp and beautifully golden. The mild sweetness of the cooked and aromatic green onion is absolutely addictive. If you've never made Korean food before, this is an accessible and tremendously delicious place to start. Notes: The green onion pancake my mom made at her restaurant was 80% green onion and that's the recipe I'm sharing with you. Some people prefer less green onion and more batter and this recipe is flexible enough for you to suit your own preferences. This is a very hands on cooking process as you can tell by the photos. 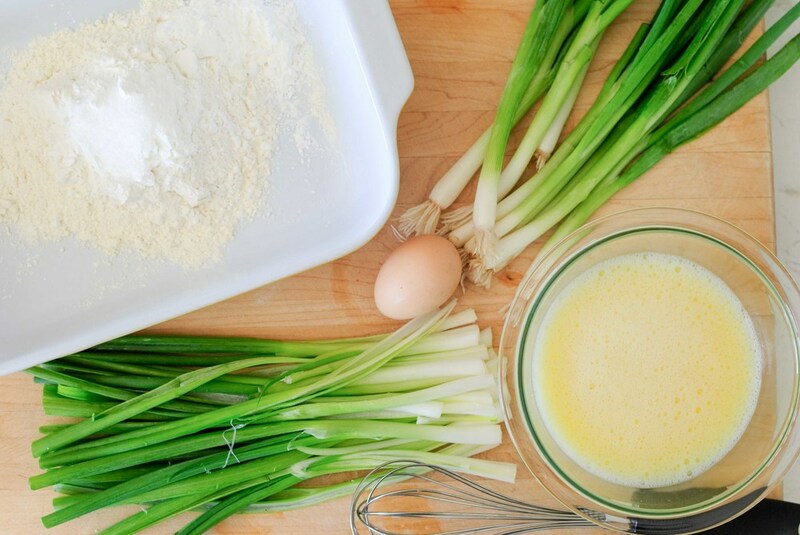 I use my hands to lay the battered green onions into the pan, to distribute the raw egg, and to press the pancake to create a crunchy crust. Don't be afraid to use your hands - it will be so much easier than a multitude of utensils. To reheat the pancakes, place them in a non-stick pan on medium heat and heat through on both sides to enjoy them again. Please don't put them in the microwave; that will make everyone sad. The dipping sauce is such a great accompaniment to the pancakes - it's worth the added few steps. 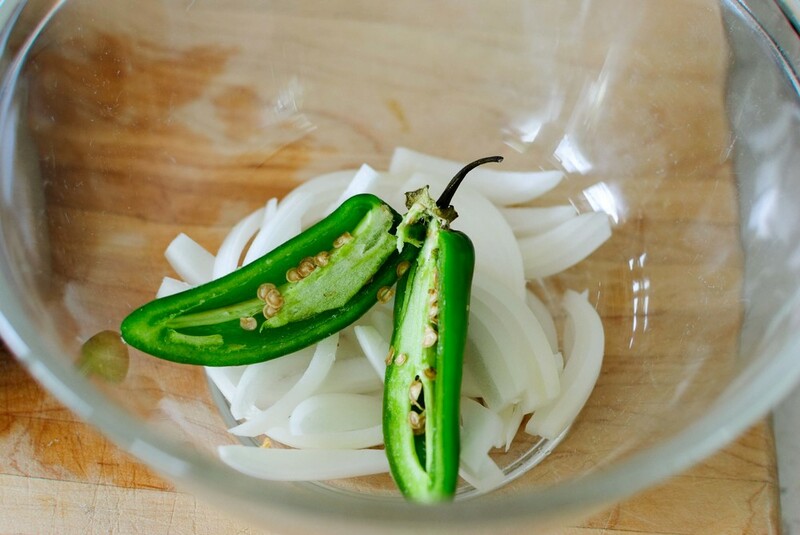 The onions and jalapeño impart their flavors into the liquid and the hot liquid quickly pickles the onion and jalapeño to tone down their harshness and heat. Rinse green onions and remove tops. Trim bottoms to make all of the green onions similar in length. Lay them on the cutting board and slice through the entire length of the vegetable - this will make biting through the cooked green onion easier and less stringy. Halve the green onions and set aside. In a medium bowl, combine water and one egg and whisk until foamy. In a shallow pan (I used an 8 x 13 cake pan) combine flour, cornstarch and salt. Start by pouring 1 cup of foamy water/egg mixture into dry ingredients and stir gently until roughly combined - like a standard pancake mixture, wet and dry patches are OK since you don't want to over-mix the batter! From there, add more liquid a few tablespoons at a time until the batter is thick enough to hold together and coat the green onions, but is not gloopy and sticky, nor runny. Heat a large pan or griddle on medium high heat with 2 tablespoons of grape seed oil. 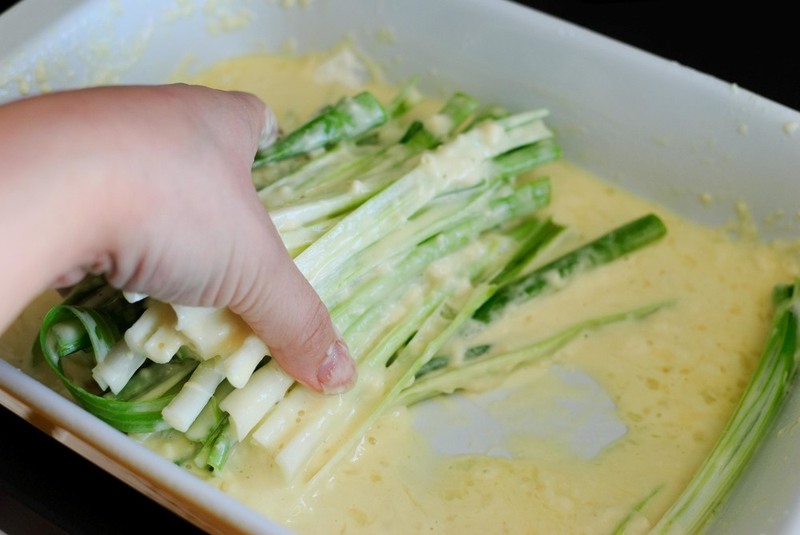 Add 1/3 of the green onions to the batter and toss until fully coated. 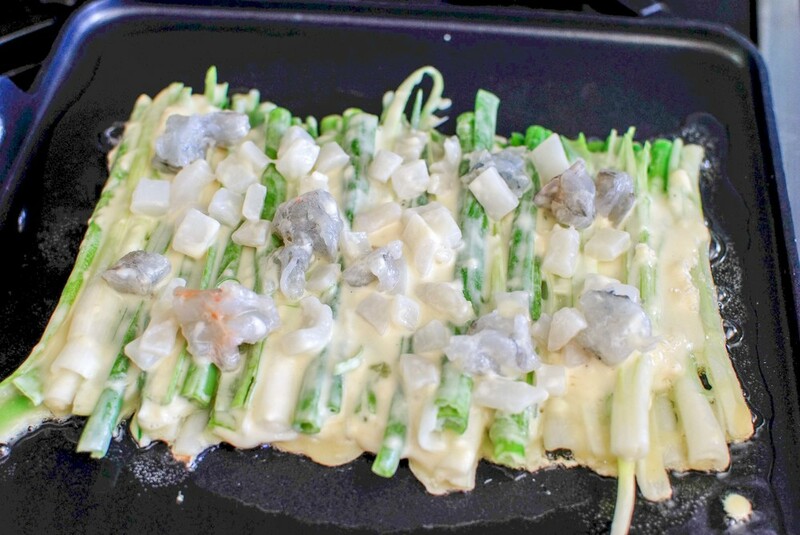 Turn the heat down and arrange batter covered green onions in the pan in a single row with no space between the green onions. Turn the heat back up to medium-high and press the green onions into the pan to create a cohesive crust. 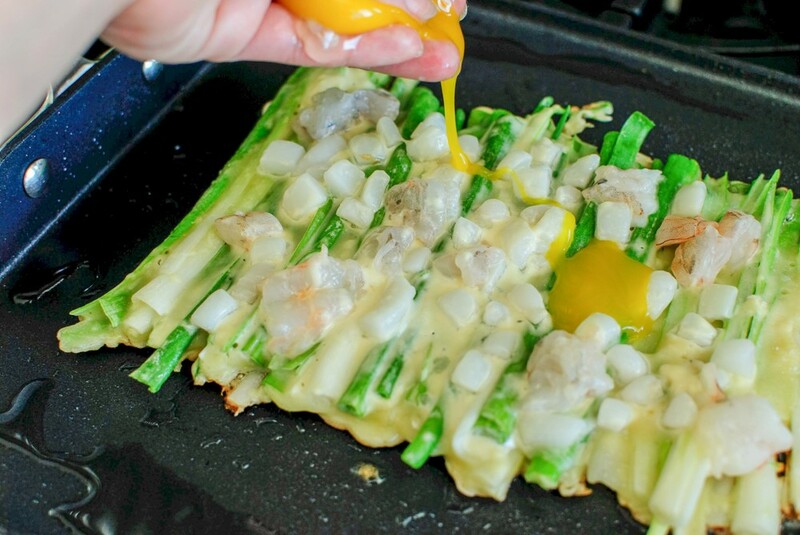 Once the batter begins to brown and the green onions are heating through, scatter 1/3 of the seafood over the top of the pancake. Beware of oil popping at this point! Press the seafood down into the pancake. Crack an egg into a small bowl and whisk lightly. Pour the egg over the top of the pancake, making sure to cover the seafood (the egg will help to secure the seafood to the pancake). When the seafood begins to warm and 70% of the pancake is cooked through (4-6 minutes), flip the pancake over to finish cooking and brown the second side (about 2 minutes). The pancake is done when the batter throughout the green onions is throughly cooked the edges are deeply browned and crisp. Flip the pancake onto a cutting board with the seafood and egg mixture facing up. Cut into generous bite sized pieces. Repeat two more times for a total of 3 pancakes. Serve immediately with the Pancake Dipping Sauce. 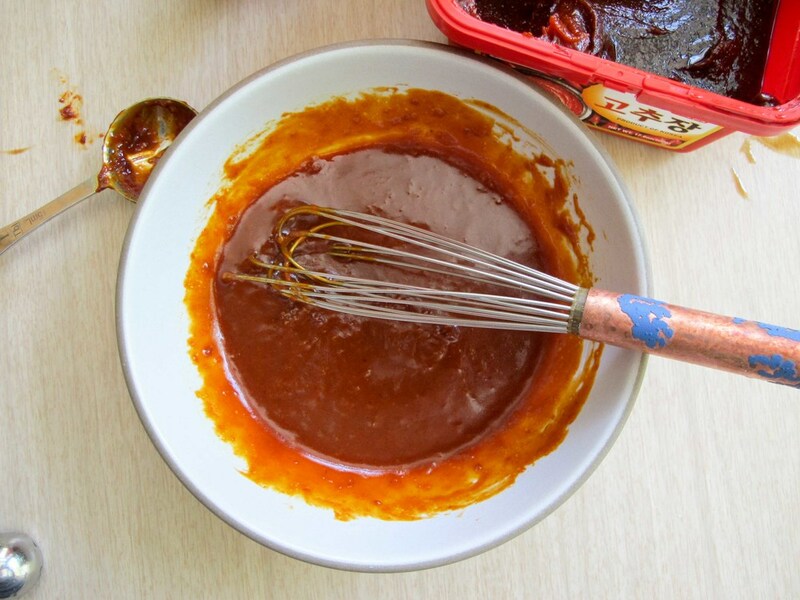 In a small sauce pan over medium heat, combine soy sauce, water, sugar and vinegar. Bring to a simmer until all of the sugar is dissolved. In a medium heat-proof bowl, place sliced onion and halved jalapeño. Pour the simmered soy sauce mixture over the onions and jalapeño and allow to fully cool before serving. Suddenly, they were everywhere. Delicate, thin stalks of asparagus appeared in the markets in all of their glory. They are on special! They are as tender and flavorful as all get out! It was time to get excited about spring vegetables. Granted, asparagus, like most all other produce, is now available year-round. While it is tolerable during the other seasons, out of season asparagus does not compare to the first of the season, local crop. 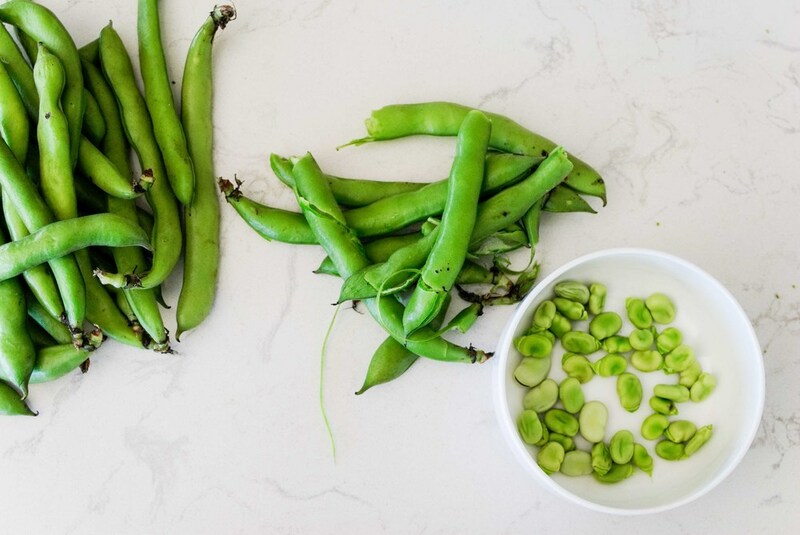 The other spring beauties that shine like green diamonds in the spring are fresh English peas and finicky fava beans. Combined, these veggies make a beautiful statement as a side dish or an alternative to a salad. My initial thought was to dress the vegetables simply with olive oil, salt, pepper and lemon juice. But then I remembered that the lemon juice would turn the green vegetables brown and unappealing. Boo! That's when it occurred to me to dress it with a gremolata: a minced combination of lemon zest, parsley and garlic. 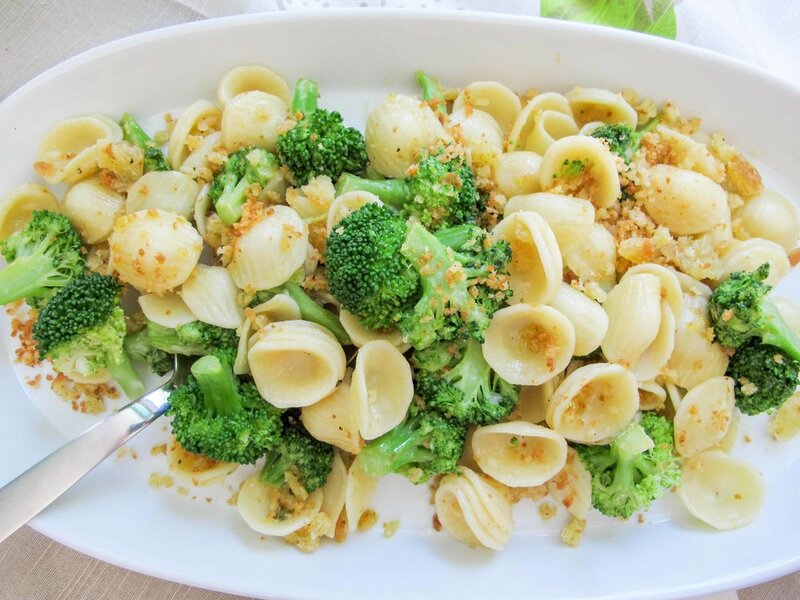 The lemon zest would provide the acidic zing, the parsley would bring brightness and even more freshness to the veggie party and the garlic does what garlic was created to do (aka make everything more delicious). 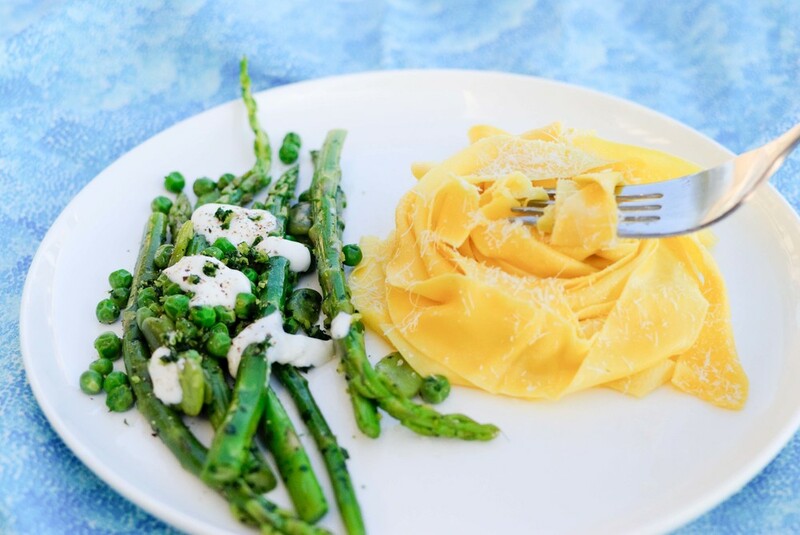 Topping this loose, green dish with a soft and white cheese really brought it together and made it a perfect accompaniment to Amy's Fresh Egg Pasta. Notes: Gremolata can be prepared several ways. 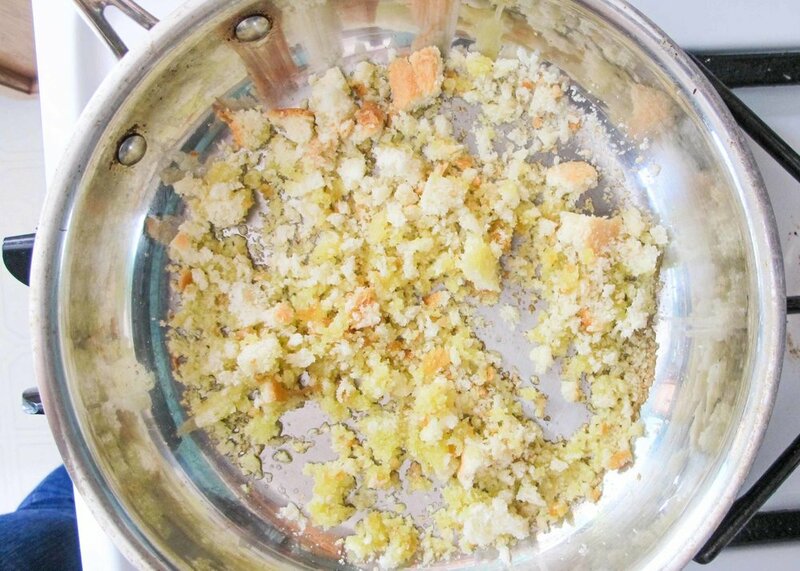 I primarily used a microplane to finely grate the garlic and zest the lemon - I found that this method cut down my chopping time tremendously. 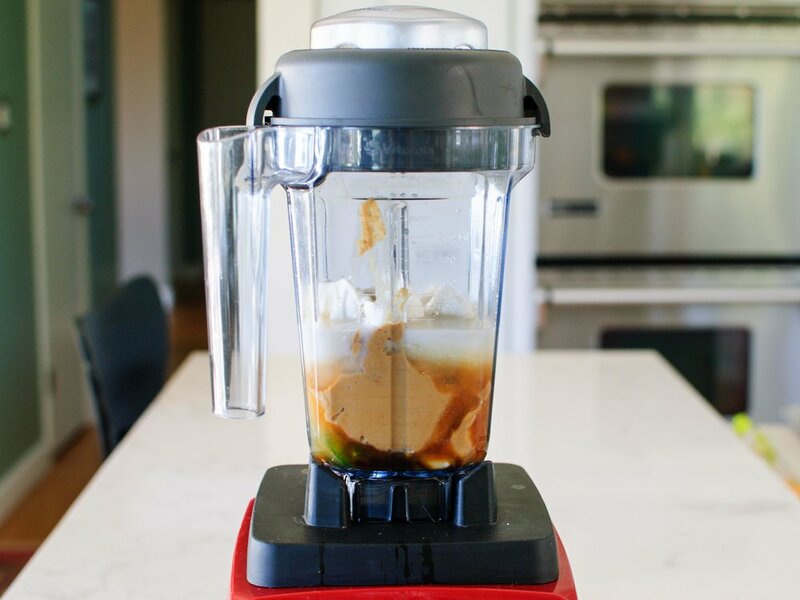 Some people use a mortar and pestle to make a paste with all of the ingredients, others chop everything completely with a knife, and some use a food processor to get the results they want. Fava beans have a very short and sweet season so they can be cumbersome to acquire. They are also time intensive to shell and prepare. I was committed to fava beans, but if you can't find them or don't want to prepare them, omitting them won't do any harm, either. In a large pot, bring salted water to a rolling boil over medium heat. Fill a large bowl with ice and water - set ice bath aside. Prepare asparagus bunches by cutting off the woody ends (about 2 inches). Blanch asparagus for 1-2 minutes depending on the thickness of your asparagus stalks and your vegetable doneness preference. 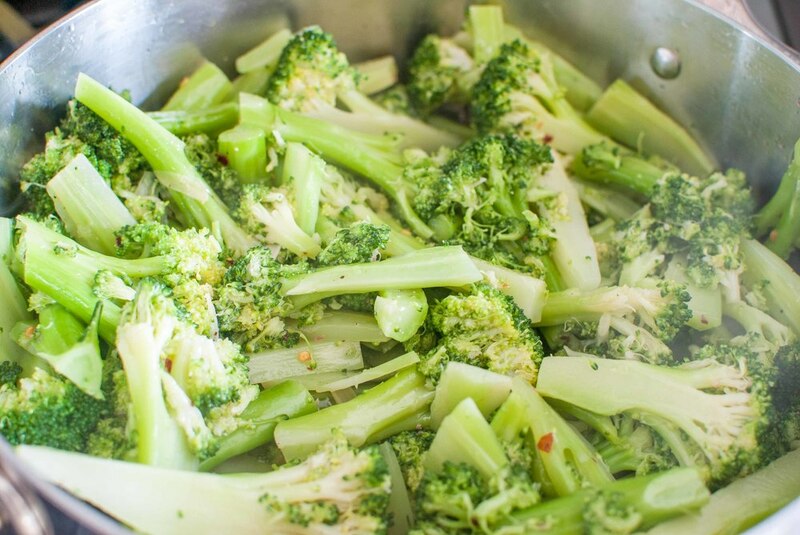 Remove from boiling water with tongs and submerge in the ice bath to stop the cooking. Remove asparagus from the ice bath onto a towel to absorb the excess water. In the same pot of boiling water, blanch and cool the peas as you did the asparagus. Set aside. Lastly, blanch the fava bean pods in the boiling water for 2-4 minutes cooking them through. Strain the pods and set aside to cool. Once the pods are cool, remove the waxy bean shells from the pod. Using a small pairing knife, slit the waxy shells to release the beans. Set the shelled beans aside. 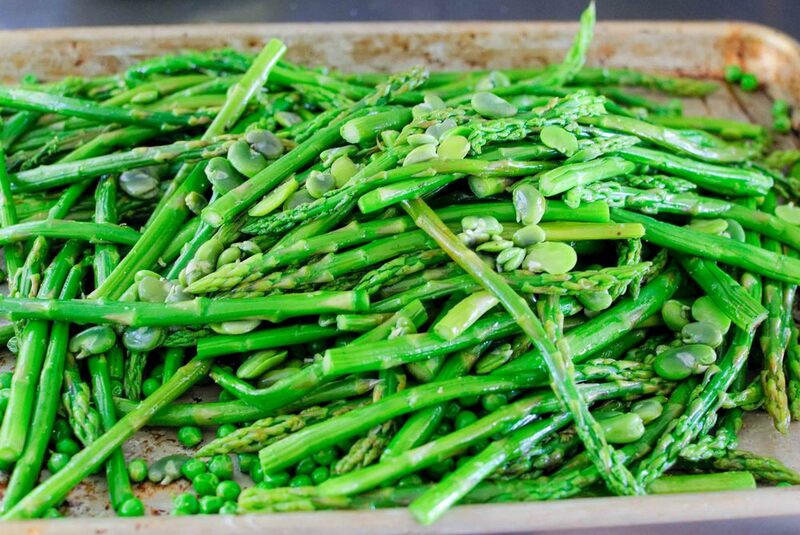 In a large bowl (I used a half sheet baking pan), gently combine the asparagus, peas and fava beans. Season the vegetables with kosher salt, pepper and olive oil. For the gremolata: using a microplane, zest one entire lemon onto your cutting board. Microplane the garlic on top of the lemon zest. Finely chop the parsley on the same cutting board, incorporating the lemon zest and grated garlic as you mince away until everything is well combined. Sprinkle the asparagus mixture with the gremolata to taste. Mix and combine, and let sit for 15 minutes to allow the flavors to meld before serving. Tear mozzarella and dot over asparagus. Taste and adjust seasoning, adding salt or gremolata as necessary! Smoothies are a quick easy way to make sure you get your fruits and veggies in and can be as varied as your imagination, tastes, and nutritional aspirations. 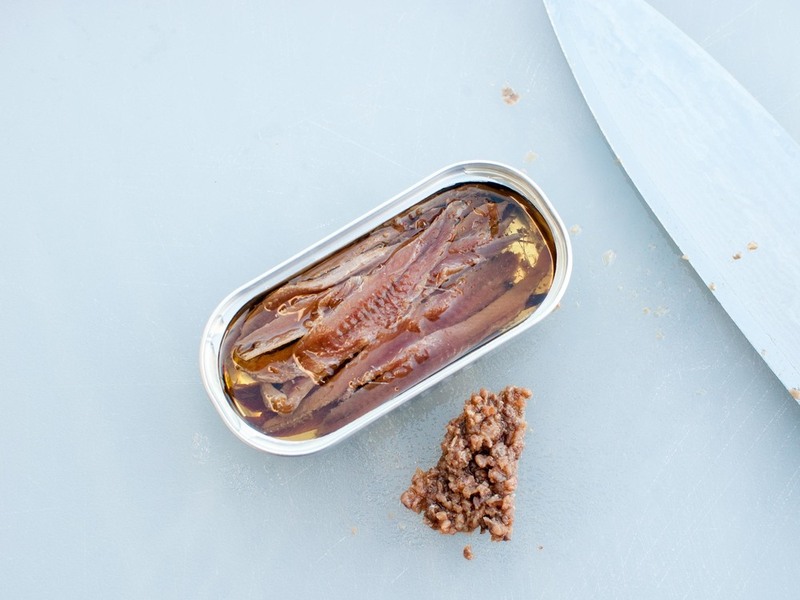 Need some extra protein or Omega-3's? 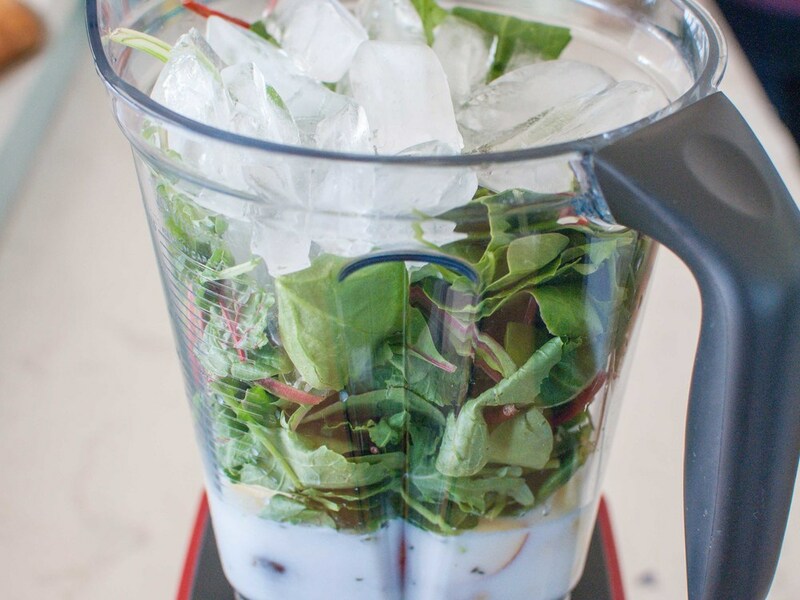 Smoothies can do the trick. I like them any time I'm feeling too lazy to make a salad, 'cause let's face it, dealing with a bunch of veggies can sometimes feel like a chore. They're also great pre or post workout, when you want something to go, or crave something simple, satisfying but not heavy. You've probably heard, Prince went to the Afterworld this week. This makes me sad. But maybe you didn't know, Prince dug smoothies. So it's only fitting I have something in my repertoire honoring him. When I'm craving something sweet and decadent, this is it. Chocolate covered berries in a glass that will have you partying like it's 1999, or at the very least, Paisley Park in 2010. And the Greek yogurt packs a lot of protein, you know, in case you have to go do the splits on top of a Grand Piano or something. Or maybe just recover from a run or spin class like the rest of us mortals. Notes: I find some Greek yogurts to be a bit chalky for my taste (ahem, Fage), so you might want to experiment with what you like and is available in your area. If I'm feeling flush, Strauss' Organic Nonfat Plain Yogurt is my favorite, but Trader Joe's Greek Style Nonfat Plain Yogurt is the best choice I've found for a decent price. 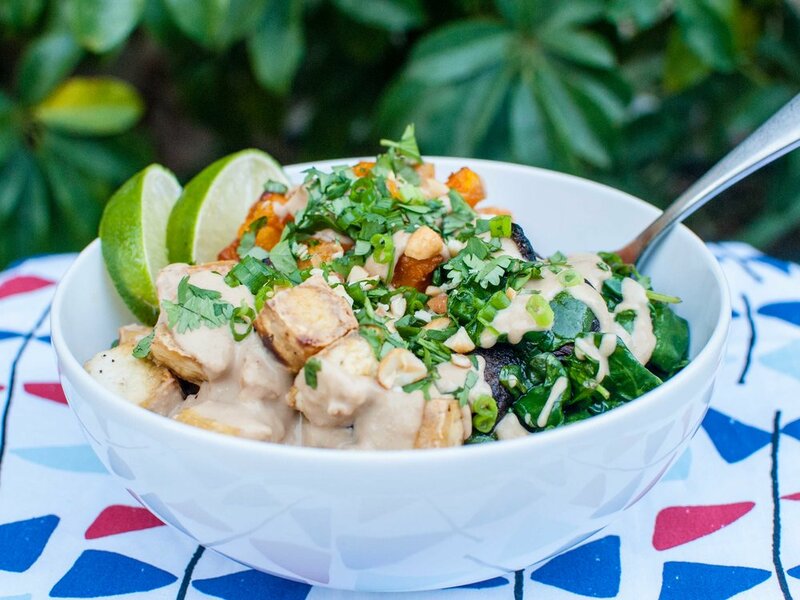 If you want to make this recipe vegan like Prince, simply swap out the Greek yogurt for cultured coconut milk or soy yogurt. Raw cacao powder can be found at natural food stores or online. My 88 year-old grandfather turned me on to putting it in smoothies. He buys it on Amazon 'cause he's fly like that, but I get it might be hard to find or on the spendy side. So it's totally cool with me if you want to use good old fashioned cocoa powder instead. You can also substitute the almond milk with any other kind of milk you enjoy. Place ingredients in a blender going down this list in order, first to last. The layering order makes a difference. Optional: 2 tablespoons hemp hearts or chia seeds if you're looking for some Omega-3's. Add into the blender after yogurt. One of my best friends lives in Portland which is a great food city. When I visit, we get to catch up and eat. But man, that food can be rich. Tasty and Sons, Pine State Biscuits, I'm looking at you. So on a day when I had to seek out lunch solo, I set out to find some yin to this kind of yang and stumbled upon a vegan joint called Canteen. They make a mean walnut taco salad, and smoothie maker that I am, I fell in love with their Apple Ginger Greens. I went back the next day for another one and then set off to recreate this at home (with some embellishments). Now it's my go-to daily drinker and preferred reset button for overindulgent times. Hello, bright, fresh, photosynthesis in a glass. Notes: Smoothies are best when consumed immediately before ingredients start to separate. If that does happen, 'cause hey life, simply grab a spoon and stir. Just don't wait too long. There is a point at which the funk sets in, and no one wants to drink that. Trust me. Kid stuff: Smoothies are also a legit way to get healthy stuff into the bellies of the little people in your life. Smiles and yums are much more fun than having to deal with kids' grumbles and eww's as they push something green around their plates. You know they're hoping you step away from the table long enough that they can slip it to the dog or sneak it into the garbage disposal (my sister's signature move when we were little). If you get the kids involved in the smoothie making process, this only increases the chances of them loving what you've made together. Plus, bonding. So, blend, taste, experiment. Color outside the lines and blend again. Does it need more banana? More berries? Toss it in! And when you get them to sign off with a thumbs up and a nod, they've just entered into a contract with you. Yes, kid, now you've got to drink the whole glass. I'm a cunning aunty like that, and usually, I'm rewarded with grins and smoothie mustaches all around. For The Green Canteen, you'll want to either skip or go easy on the ginger until you know what their sensitive palettes are up for. Baby spinach is the mildest of greens and so the least noticeable. I'm a fan of the mixed bags of baby chard, baby kale, and baby spinach which are often marketed as “super greens” or “power greens.” Costco is a great place to source a nice big bag for a reasonable price. Play around, see what you like, then keep some on hand. Variations: For a cooler, thicker treat on a hot day, substitute 1 cup of frozen mango for the ice. You can also blend in some fresh mint leaves to add even more tropical summer flavor. And really, swapping in any frozen fruit can mix this up if you start to get bored. Place ingredients in a blender going down this list in order, first to last. The layering order makes a difference. And yes, there's an infographic for that. Optional: ½ tbsp to 1 tbsp honey (if you or the kids need more sweetness). Add to blender after coconut milk or coconut water. 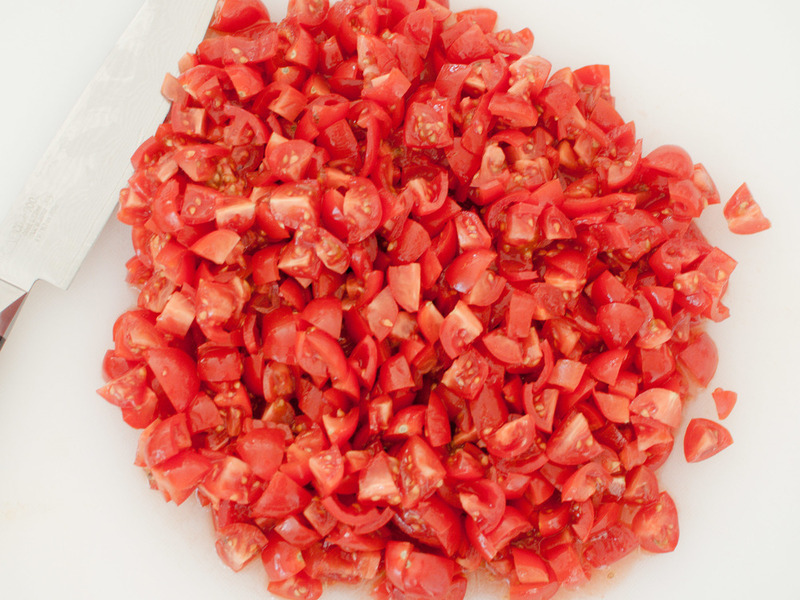 Fresh Pico de Gallo is simple to make, and so much better than prepackaged stuff! It's the perfect accompaniment to Steak Fajitas or just a bowl of tortilla chips. Notes: When tomatoes aren't in season, use grape or cherry tomatoes to get a sweeter, more concentrated tomato flavor. Adjust the amount of jalapeño to your tastebuds - leaving the seeds and ribs in will make the salsa spicer, removing them will make it less spicy. Taking the time to dice the tomatoes, onions, cilantro, and jalapeño into very small pieces will give you the best flavor. You can also use a food processor to lessen the work, but be careful to only pulse a few times, or you'll end up with a watery mess. Liquid will accumulate as the salsa sits, so feel free to drain off any excess. Lastly, salt makes a big difference in a simple recipe such as this - make sure to taste it just before serving and add additional salt, if needed. 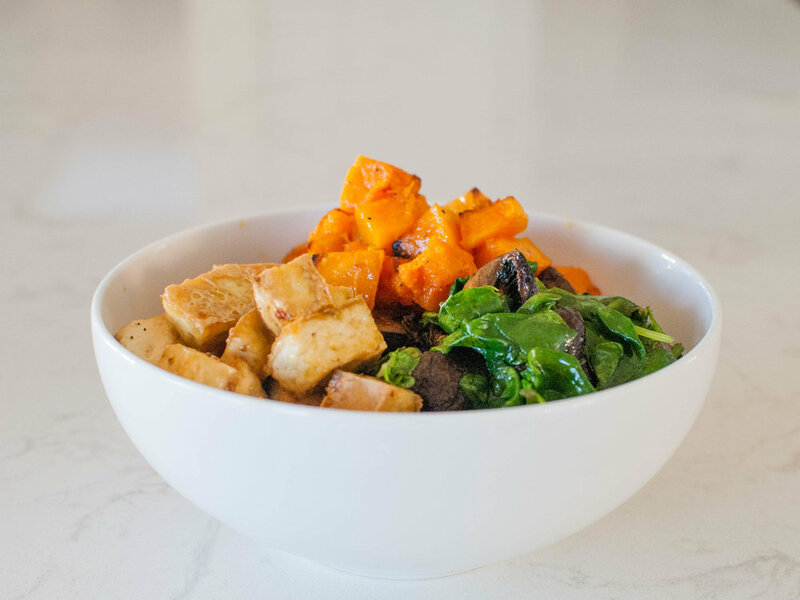 Combine all ingredients into a bowl and stir together. Season to taste with additional chile, lime juice, and salt. It will keep in the refrigerator for up to one day. Stir well and drain any excess liquid that has accumulated in the bowl before serving. Notes: This is essentially the same as the recipe from J. Kenji Alt-Lopez's The Food Lab, except that I used half and half instead of heavy cream. The results are similar, albeit a bit lighter on the gut. Given how heavy holiday foods tend to be, this seemed like a good compromise to me! Per Alt-Lopez's recipe notes: Because of variation in the shape of potatoes, the amount of potato that will fit into a single casserole dish varies. Longer, thinner potatoes will fill a dish more than shorter, rounder potatoes. When purchasing potatoes, buy a few extra in order to fill the dish if necessary. Depending on exact shape and size of potatoes and casserole dish, you may not need all of the cream mixture. Adjust oven rack to middle position and preheat oven to 400°F. Combine cheeses in a large bowl. Transfer 1/3 of cheese mixture to a separate bowl and set aside. Add cream, garlic, and thyme to cheese mixture. Season generously with salt and pepper. Add potato slices and toss with hands until every slice is coated with cream mixture, making sure to separate any slices that are sticking together to get the cream mixture in between them. Grease a 2-quart casserole dish with butter. Pick up a handful of potatoes, organizing them into a neat stack, and lay them in the casserole dish with their edges aligned vertically. Continue placing potatoes in casserole, working around the perimeter and into the center until all potatoes have been added. Potatoes should be very tightly packed. If necessary, slice additional potato, coat with cream mixture, and add to casserole (see note above). Pour excess cream/cheese mixture evenly over potatoes until the mixture comes half way up the sides of the casserole. You may not need all excess liquid (see note above). 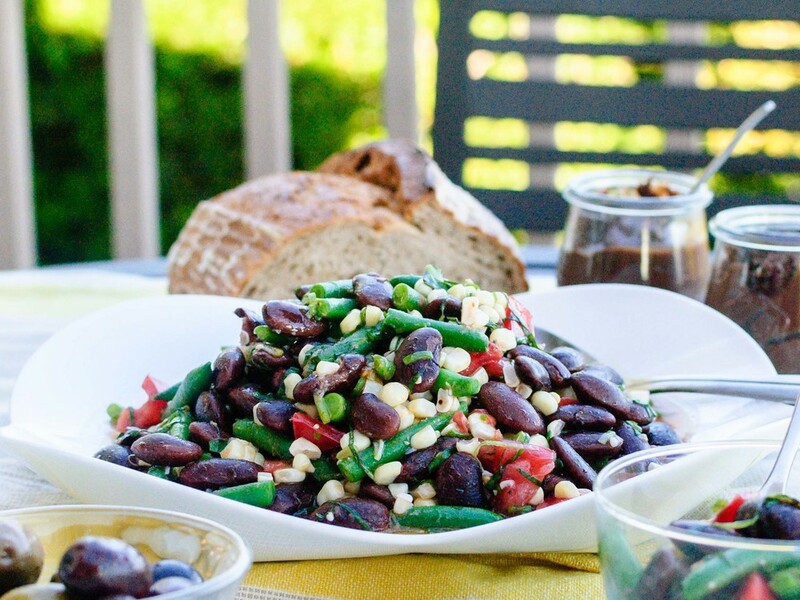 When considering what to bring as a side in addition to the Harissa Grilled Pork Chops, I wanted to make something that was packed with the protein of a sturdy bean and included a hearty, kid-friendly vegetable. This Chickpea Carrot Salad is all of that, and it's also delicious cold, at room temperature, and warmed. (When you have a new baby, you can't be too picky with the temperature of food because you'll be lucky to eat at all!) 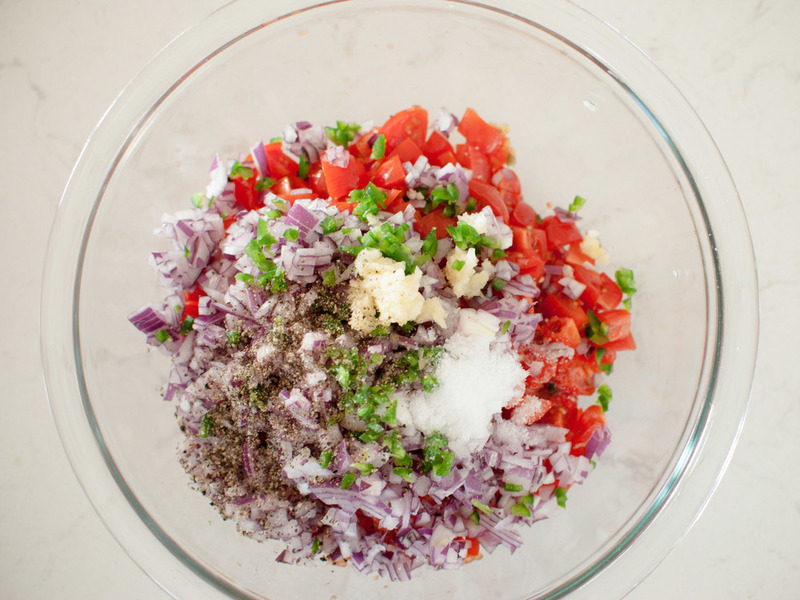 This salad is filling but not heavy, and so delicious despite the humble and simple ingredients. Notes: I wish I had tripled or quadrupled this recipe, too! It kept so well that it made an easy lunch the next day with a fried egg on top. If you have a food processor or large box grater to shred the carrots, this recipe is easy and not labor intensive. 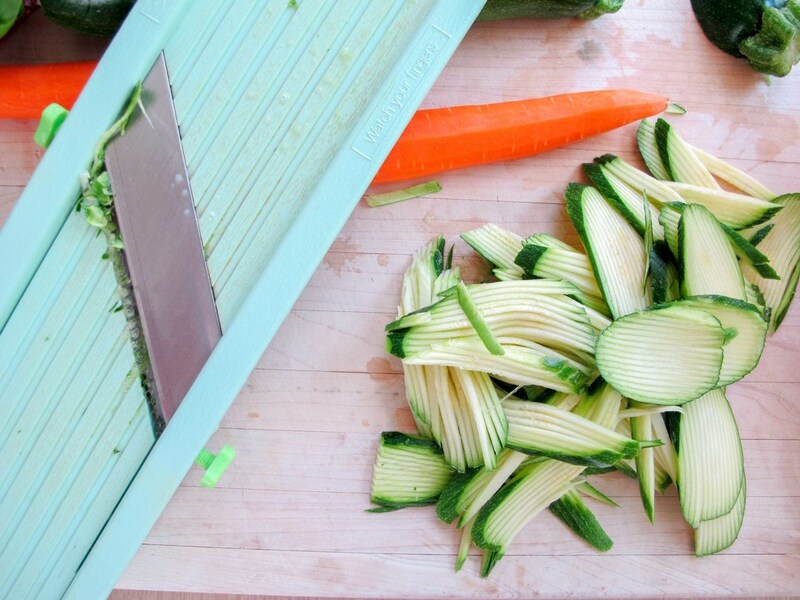 If you have neither a food processor or large box grater, this is a great way to work on your knife skills and practice your julienne! Drain chickpeas and rinse with water - set aside. Add 2 tablespoons olive oil, 2 bay leaves, 2 smashed garlic cloves, and 2 thyme sprigs to a large skillet. Heat the oil and ingredients until garlic is sizzling. Once sizzling, add 2 cups of shredded carrots and toss to coat in oil and aromatics. Cook for 1 minute. Add the chickpeas to the skillet and season with salt and freshly ground black pepper. Toss the chickpeas for a couple minutes until warmed through. Transfer to a dish to cool. Before serving remove the bay leaves, garlic, and thyme. Season with 2 teaspoons freshly squeezed lemon juice, 2 teaspoons of sherry vinegar, and adjust seasoning. Garnish with herbs just before serving. Noodles! There are thousands of different kinds, and I love them all. But I am particularly fond of soba - chewy, nutty, Japanese buckwheat noodles. When I feel health-conscious, I choose soba noodles because . . . I’m not sure! They are gluten-free, but that doesn’t matter to me. They are lower calorie than pasta made with wheat, but that doesn’t matter to me either! I think it’s because they can be dressed lightly and eaten cold that makes me *feel* they are a more healthful choice. I dressed the soba noodle salad with a Ginger Scallion Sauce, courtesy of one of my favorite chefs, David Chang. For the children, I set aside their portion and used the remaining sauce from the Crispy Chicken Wings to dress their noodles. Notes: Cold noodle salads are flexible and easy to customize with different vegetables, proteins and sauces. 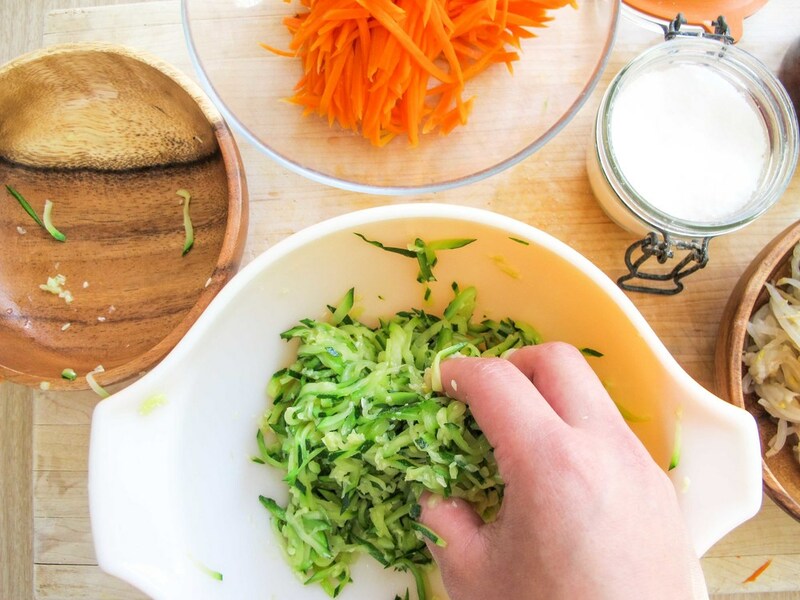 In this recipe, I used shelled edamame, julienned carrots, roasted cauliflower, and red bell peppers; you could also use shredded cabbage, thinly sliced half-rounds of cucumber, julienne of zucchini, sautéed mushrooms, blanched baby spinach . . . really, anything! The same goes for sauces I’ll often make a rice wine vinaigrette, a carrot ginger salad dressing or a very light peanut sauce to dress soba. Cook soba noodles according to package directions. Rinse with cold water and dress lightly with sesame seed oil to prevent the noodles from sticking. Set aside. While the noodles are cooking, add 1 tablespoon oil to a medium pan, bring up to medium-high heat, until oil barely begins to smoke. Add cauliflower to the pan, and cook until the first side is brown - about 2-3 minutes. Shake pan vigorously and continue to cook until desired doneness. (I like fork-tender cruciferous vegetables, so I cooked mine for about 6 minutes). Set aside. Julienne carrots and red bell peppers, set aside with prepared edamame. 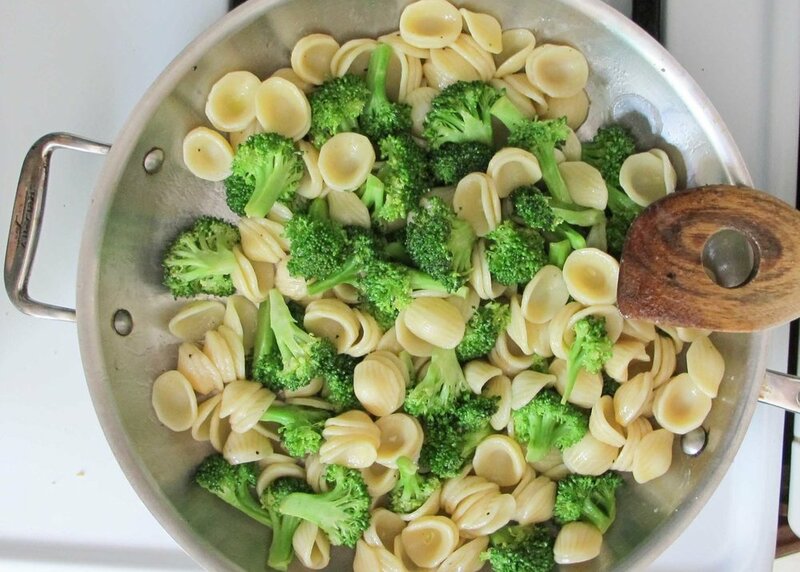 Combine noodles and vegetables in a large bowl. 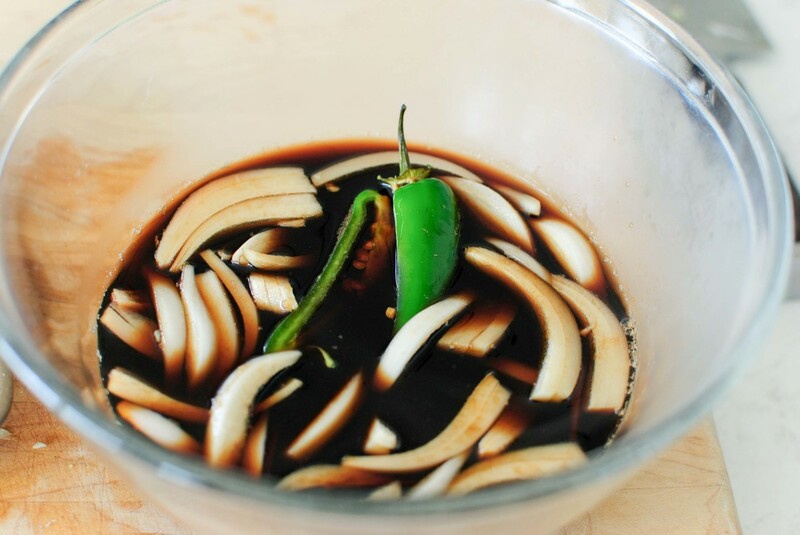 Mix together the scallions, ginger, oil, soy sauce, vinegar, and salt in a bowl. Taste and check for salt, adding more if needed. In and of itself, grilled cheese is a perfect meal. It combines the three food groups: bread, butter and cheese. But because I added *bacon* in the Bacon Jam and Cheddar Grilled Cheese Sandwich, I thought I would lighten up the meal with a salad. This Beet and Cucumber Salad is simple and straightforward - you don't even have to make a vinaigrette! The crispy crunch from the cucumber and the velvety, sweet beets are a great accompaniment to the slightly spicy baby arugula. Don't be deceived - the recipe is very simple, but the salad turned out to be tasty and balanced. Notes: Letting the salad sit for a minimum of 30 minutes after being dressed is a must. Let the cucumbers and beets marinate separately to avoid beet-stained cucumbers. I used prepared and packaged beets for this recipe, but you can roast your own if you have the time and patience. Combine vinegar, shallots and sugar in small bowl to make a marinade. Set aside while preparing vegetables. Cut beets into wedges. Toss with 1/2 cup of marinade to coat. 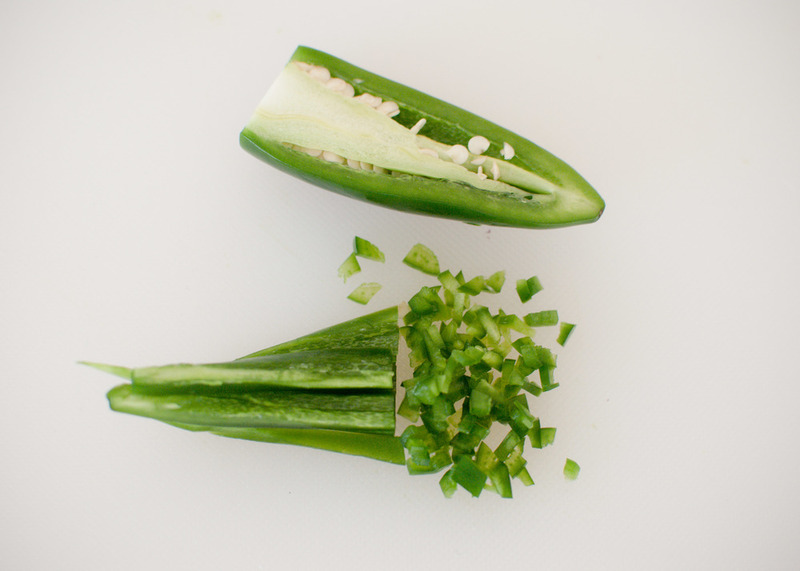 Place cucumbers in large bowl and toss with remaining marinade. 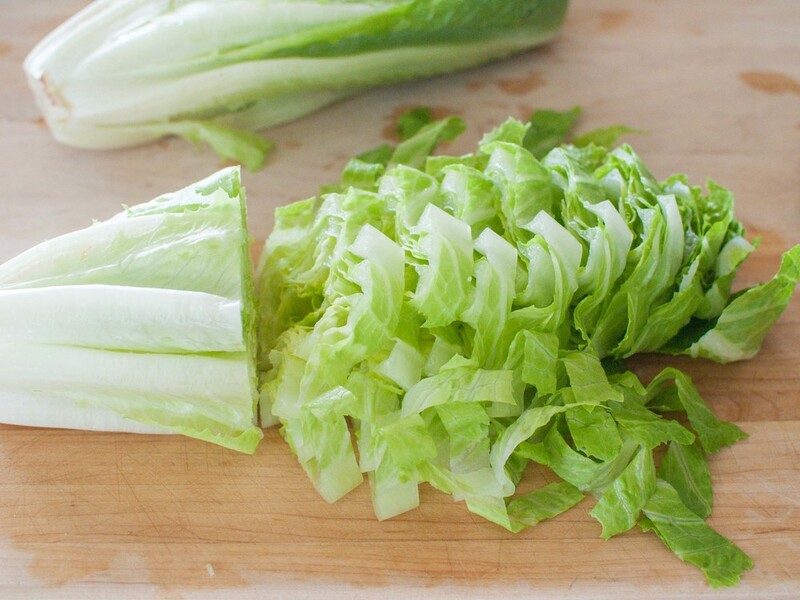 Season salads to taste with salt and pepper. Cover separately and chill for at least 30 minutes or up to one day. Drain beets of liquid and arrange on platter towards the outer edges; rinse colander clean, drain cucumbers and arrange in the middle of the platter. 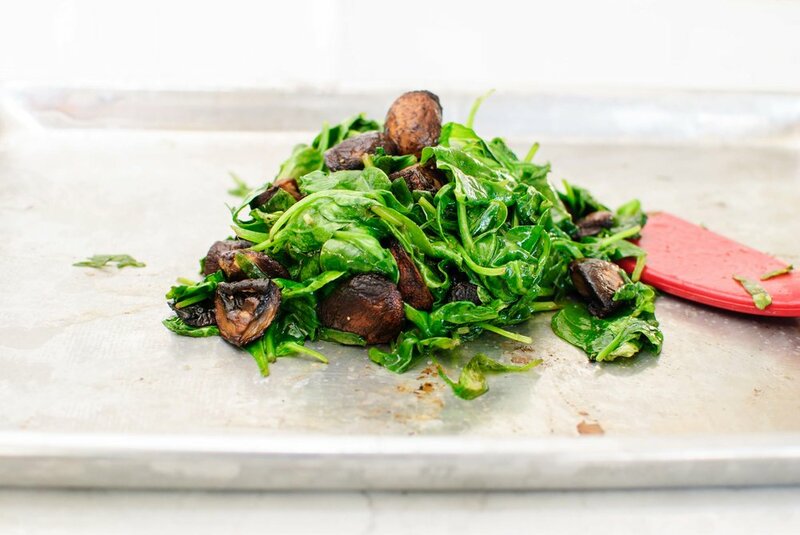 Scatter a handful of arugula on top, garnish with herbs.